This bear was inspired by a rather strange looking plastic bear. My daughter has a vast collection of plastic animals all MADE IN CHINA. Most of the bears are on all fours but this particular bear is upright and looks like a rather hairy man in hairy underpants showing off his muscles. Originally I had done a more realistic interpretation but his face was too stern so I redrew him with this rather dreamy moon face. 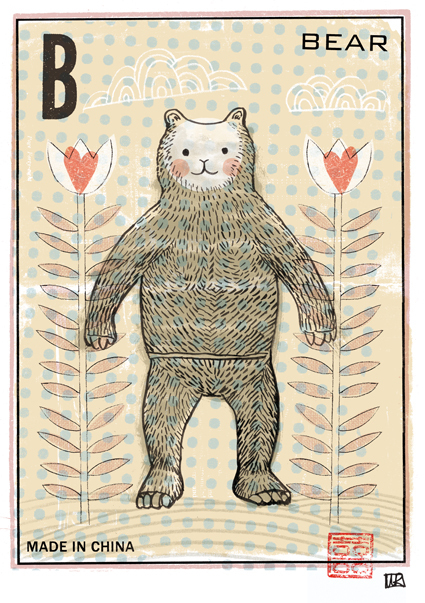 I love loteria cards and vintage children's alphabet's hence the B is for Bear. I also love slightly offset printing and the visible screen dots that you used to get with cheap mass produced textbooks. 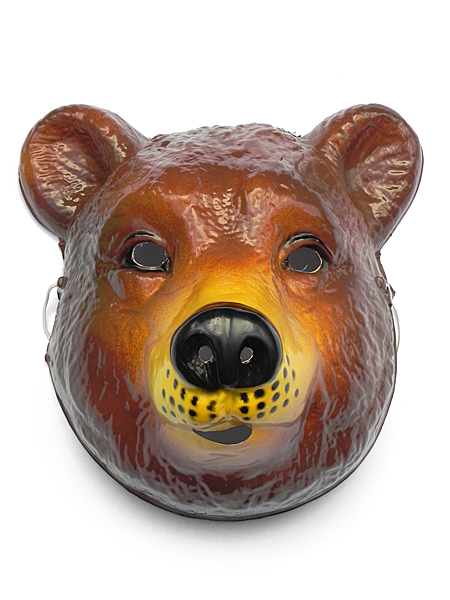 This plastic bear mask is from All Occasions, 551 King Dinzulu Road (Berea Rd), 031 202 9710. A treasure trove. Everyone knows how much I luurve party shops, they give me the same feeling as libraries. I could hide in them all day. 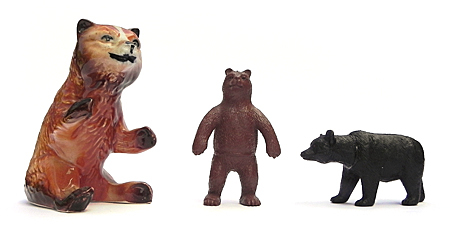 This little sloth of bears are from left: a ceramic dreamy bear from Eclectic Antiques, 155 Gordon Road, 031 303 2218, he has such weird posture (as if he is waiting to catch a ball) and a fetching white stripe on his forehead. The middle bear is the hairy underpants culprit who spawned MADE IN CHINA and the black bear has doleful zombi red eyes. you're killing me lady! now i need a bear too! Hee hee, that's perfect I need lots of beautiful frames! I love your drawing so much, I'm tempted to have it printed in large format printing and framed!